My favorite R package, ggplot2, recently introduced enhanced support for choropleth maps. 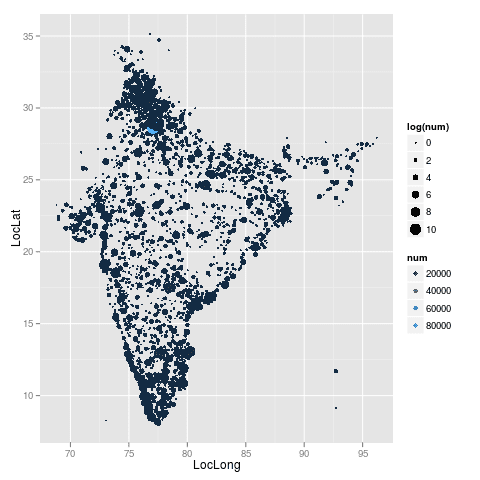 I’d like to make some of these kinds of maps with oDesk data, but as a first step, I thought I’d just plot the locations of all of our India-based contractors by city. In the plot below, dots size as log-scaled by # of contractors reporting that city. The massive light blue dot near Delhi is default coordinate when we’re missing the city. For those of you who know India, anything surprising/interesting here? This entry was posted in Uncategorized on March 6, 2012 by johnjhorton.